Culimancy: a term best described as Cooking Magic. Why is this page called "Adventures in Culimancy" and not "Recipes in Cast Iron?" What is "chaos magic?" Is it witchcraft or Satan? An ongoing project to take authentic recipes from ancient cookbooks from the Middle Ages through the early American era, and translate them into modern kitchen recipes. Want to be sucked into the Cult of Cast Iron? Come on over to Cast Iron Cooking on Facebook , where cast iron enthusiasts are enjoying themselves, indulging in their obsession with cast iron, and cooking lots of great meals. A simple dough recipe, to make and bake your own bread and biscuits in whatever shape you want. Using the famous no-knead bread recipe, here's an easy-to-make pizza that you can put together with your kids…and feed the whole family. Use Bisquick® biscuit mix to make a tasty pie with any filling you want – either a meat pie or a sweet pie. A simple recipe that doesn't require yeast. Also called "mealie bread," this is a South African style of cornbread that uses sweet corn kernels in the batter. From Liz Taller-Sapp: a quick and easy brown sweetbread. Steamed molasses bread – a New England specialty, meant to be served with Boston Baked Beans. A slow-rising recipe to produce a huge loaf of Italian spiced cheese bread. A classic recipe for an easy-to make and wonderful-tasting Northern bread. A traditional New England dish. Also known as leftover hash and, of course, corned beef hash. This is a classic dish from Great Britain with a delightful name and some less than delightful ingredients. The unofficial national dish of Canada: French fries, squeaky cheese curds and hearty beef gravy! Thanks to the wonderful movie Ratatouille for this dish. A traditional Irish dish of mashed potatoes and cabbage. A basic recipe to put together this dish, often used in casseroles and other recipes. Cook up cabbage and other veggies in a hot pot with sweet-and-sour vinegar dressing. The ancient Chinese secret! Why spend $25 to $100 on a rice cooker when you can do it yourself? Baked mac and cheese, shaped into a huge cake and drizzled with cheese. An Italian delicacy, consisting of no more than pasta with garlic and olive oil. You'll be amazed how delicious this is. Because one sauce is never enough. A quick and easy meal of fresh roasted veggies. It's not just healthy and easy to make – it's delicious. A delicious stew of chicken in spicy curry sauce, with lots of tubers, roasted in a huge pumpkin! As good as store-bought ketchup, maybe better! For the hobbit in all of us. A stir fry dish that produces ramen noodles far more tasty – and nutritious – than those awful cup-o-noodle packs. Creamy rice and mushrooms prepared in the traditional Italian style. Spinach and hash - two disgusting-looking, but good-tasting, flavors that go good together. Comfort food at its finest – mac and cheese with a homemade cheese sauce. Easy to make, and far better than roasted peanuts from the jar. In November of 2014, I experimented and used the recipe for Skillet Roasted Chicken to cook a 12-pound turkey in cast iron at 500 degrees Fahrenheit. The result: an excellent, well-cooked turkey that took only ONE HOUR AND FIVE MINUTES to roast! Whether you call it Hamburger Helper, American goulash, or American chop suey, this is filling and delicious. A classic Irish dish of sausages, bacon, and potatoes cooked in cast iron. Roast chicken is one of the perfect meat dishes, because there are an infinite number of different ways to prepare it. Here's one version that kicks it up a notch: add lots of BACON! Barbecue flavoring adds to the traditional beef stew. This is prepared slowly, allowing the beef to become especially tender. Not just Boston Baked Beans – delicious pulled pork with baked beans! 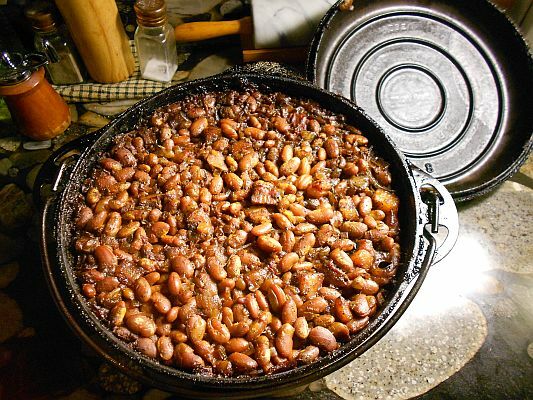 The national dish of Brazil is a pork-and-beans stew from Brazil with far more meat than beans. This will satisfy ANYONE with a craving for meat! Just like the greasy fried chicken you get at Crown and Kennedy Fried Chicken…except you don't have to go into the 'hood to eat this! A take on a classic New England delicacy, lobster. However, rather than being boiled, this lobster is split and seared in a hot cast iron pan, then roasted in the oven. Jambalaya cooked in the Southern cajun tradition: in the great out doors, in a huge cast iron pot. A take on "chicken under a brick" that uses two hot cast iron pans…and a cast iron iron! A pot pie with a unique, chewy and delicious crust…far better than those microwave pot pies sold at the dollar store. A simple recipe for roast duck that requires only two hours' cooking time…and gives you a lot of duck fat. A novel way to use your electric crock pot to make a pot full of moist, tender, fall-off-the-bone chicken. Based on the classic French recipe poule au pot, this recipe uses a dutch oven to cook a delicious and easily made roast chicken. This one is so basic, with the results consistently good, you'll be coming back to it again and again. Julia Child's wonderful, easy, and delicious adaptation of the classic French dish. The famous Saint Patrick's Day dish…that actually isn't from Ireland. But it's about as Irish as you can get! A fast, easy, and delicious Cajun dish of rice and meat, cooked up jambalaya style. A chili recipe from a friend from the past. A very easy, tasty,and surprisingly popular, way to roast chicken and rice in a cast iron dutch oven. A New England clambake is a seafood feast that can't be beat! Cooking with a dutch oven – cast iron or ceramic, the dutch oven is a great cooking weapon. Use a cast iron dutch oven to cook a whole turkey in half the time it would normally take to roast it in the oven. Use a cast iron dutch oven to prepare a roast chicken that's every bit as good as the rotisserie chicken at the supermarket deli counter. Now you can have the failure pile sold at KFC as its "Famous Bowls" – right in your own home. The famous and popular Chinese take-out dish…that actually doesn't come from China. Slack and comfort food with !!!BACON!!! It sounds disgusting, but it's fantastic. Another comfort food that you'll crave every Fall. "Groundnut" is the African name for peanuts. Here's a very simple and very popular dish served across eastern Africa of chicken stewed with…peanuts and peanut butter. Two million United States Army soldiers can't be wrong, can they? Also known as brawn, souse or fromage de tete, this is an old-style cold cut made from boiling a pig's head. It's actually an amazing delicacy. Meat and vegetables on a budget. Are you worried about the rising cost of BACON! Just make your own at home…it's better than anything from the store! Make a delicious baked ham in a cast iron pan…in less than two hours. A basic Indian curry sauce recipe for chicken. A very hot and spicy (and tasty) dish from the Carribean. A Southern-style seafood boil is an event not to be missed! Doing the low country boil with chicken instead of seafood will give you a huge pot of tasty vittles. A recipe for people who love the smell and taste of vinegar. Meat loaf taken to the extreme. A delicious and easy shredded roast beef recipe, prepared in a cast iron pot. Italian lasagna is a feast that must not be missed! This one is dedicated to my beloved Typical Italian Grandmother, bless her heart. You can't make an omelette without breaking a few eggs…but this method will let you make an omelette without having to fold it over. The ancient Chinese secret of producing a restaurant-style Chinese stir fry in your wok. Easy fast, and maybe as good as grilling barbecue chicken outdoors! An Asian treat that can't be beat! The traditional Italian dish of pasta and beans, done as a pasta and meat sauce dish. A take on traditional cajun jambalaya, made with pasta rather than rice. Puerto Rican roasted whole pork shoulder. This dish is popular worldwide and served on many holidays. Pho: Vietnamese pho noodle soup with beef – one of the most delicious foods in the world! 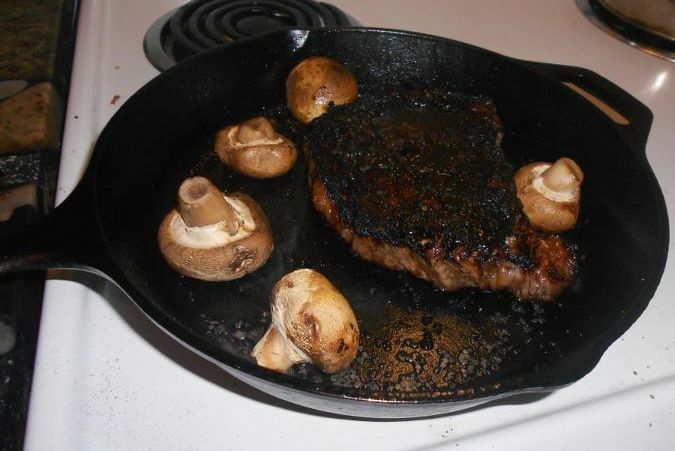 A fine and expensive cut of meet deserves first clast treatment – namely, "reverse sear" roasting in a cast iron skillet. You've never had rabbit before? This is a good way to start. The traditional Italian meat and pasta dish – not a tomato-laden "spaghetti sauce," but a true meat sauce. A bloody rare roast beef, prepared to be pink and juicy and dripping with blood. A carnivore's delight. Presenting a classic recipe for holiday roast turkey, as prepared by none other than Vincent Price, the icon of horror film…and gourmet chef! On December 15, 2011, I cooked the best steak ever. Here is my story. The easiest way there is to quickly roast a chicken. When it comes to roasting a turkey in cast iron, low and slow is the way to go! See for yourself. One of the easiest and best date night dishes. It has steak, cast iron, and fire. On a low to medium budget, you can make tasty chowder in your cast iron dutch oven. Italian-style fish soup that dates back to the days of the ancient Romans. Make a small cake for yourself in the microwave oven! Because everything is better when your put bacon on it. What? Angel food cake in a cast iron bundt pan?!? Yes! An ancient medieval standby, but still delicious today. Abby Normal's Favorite for Halloween and Graduations. My own invention – an apple pie baked in a bundt pan. Wait until you see the result! The classic cake topping enjoyed by the aristocracy before cake frosting was discovered. And still worth trying today. It must be healthy – it has carrots in it! Actually, what you get here is a thick, rich cake with cream cheese frosting. Chocolate heaven in a cast iron pan. A classic and wonderful Italian pastry. Not just a moist and delicious cake – also, some tips on making this cake in a manner that doesn't require you to grease and flour the cake pan. Why settle for a bland, meager store-bought pumpkin pie? You can use a cast iron pan to bake a monster pumpkin pie that puts store-bought pies to shame! These cookies will literally melt in your mouth. Jumping on the pumpkin spice bandwagon and loving it. A chocolate dutch oven treat. Chocolate cake with a hot molten chocolate center – if this isn't sheer chocolate decadence, then nothing is! Simple and much better than canned. A variation on ice cream that uses mashed bananas and cream, rather than the usual frozen milk. Sinfully delicious dark chocolate cake, summoned from the nether realms with a heavy metal bundt cake pan. The wonderful "sweetness of milk" from Argentina. A simple and easy egg pancake cooked in a cast iron skillet. Possibly the easiest pancakes you can possibly make from scratch. What can you call a monster-sized cookie baked in a bundt pan? Epic! What more can you say other than this: giant chocolate chip cookie! Make it yourself – it's easy and tastes delicious. Why have those chemical-laden microwave popcorn packets when you can make it yourself, just as fast? Chocolate chip truffle cookies so horrible, you'll have to eat them all so that no one else gets them. It's amazingly easy to create the finest vanilla extract on the entire planet. Easy to make at home with only two ingredients! Easy to make with your kids, and utterly delicious. A hot fudge sauce that can't be beat, to top your ice cream sundae. A Jamaican tradition for weddings and at holidays, especially Christmas. This is nothing like those store-bought fruitcake bricks. Yeah, it's an old joke – but it's still funny. Around 2014 or so, the Krispy Kreme doughnut company released a boxed cake mixed to stores, based upon its recipe for glazed doughnuts. This is an attempt to recreate the flavor of the cake. A tasty homemade pastry dish. 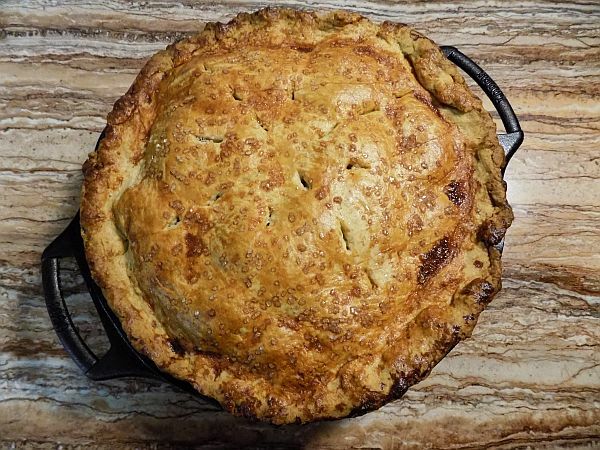 Use cooking magic to conjure up an apple pie with a flaky crust and delicious filling that won't leak all over the place. This recipe takes a bag of candy corn and makes it completely disappear! A New England take on the classic recipe for Skillet Cornbread. It creates a sweet custard-like corn cake. A decadent drink that's good enough for kids and adults alike. The classic Southern dessert, consisting of sugar, syrup, and pecans. No wonder everyone loves it! An ancient, sweet, and very tasty Oriental dish that can be served for breakfast or dessert. Another way to prepare rice pudding, without stirring but with a lot of patience. So easy, you can let your kids make it (if you watch over them when it goes into the oven). Use the seeds left over from carving your jack-o-lantern to make this tasty, salty snack. The best cornbread is always made with cast iron – no exceptions. a.k.a. The World's Greatest Brownies. They're naughty and they're easy, but ohhhhh so good. A dangerous cake using genuine Tennessee moonshine. Some cast iron magic: transform a little bit of cocoa powder into a lot of melted chocolate sauce…using candy corns! This is the legendary chocolate cake that took the country by storm in the 1960s, and made the bundt cake pan a household name. One of the richest and easiest chocolate cakes you'll ever make…and it contains no eggs and no milk. Use your wok to make…popcorn! For those special times of the year. The classic Christmas pudding, steamed up in a classic British style. As a companion, we also present that other traditional holiday pudding that everyone sings about…but almost no one knows what it is. What's special about this homemade eggnog recipe? You can enjoy it at any time of the year! A dish from the Deep South, traditionally served on New Year's Day. You'll never settle for atrocious store-bought fruitcake ever again when you see how easy it is to make a delicious fruitcake! The famous poultry sauce in a jar, seen in the classic Mister Magoo's Christmas Carol. How could we have Thanksgiving without it! A pork pie dish from Canada or France, usually served on Christmas Eve. A spicy and sweet meat dish that's quite different from St. Patrick's Day corned beef. Cast Iron Cooking: the Facebook group for cooking in cast iron. YouTube -- Cast Iron Chaos: Amateur cooking videos (and occasionally other subjects) by E.W. Modemac. The content of this Web site is copyright (c) E.W. Modemac, the administrator of Cast Iron Chaos. Please read our Copyright Notice. 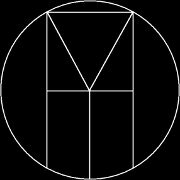 This wiki site uses Oddmuse Wiki, which is based upon Usemod Wiki. Counter started on May 4, 2005.